This is an inflammation of the cornea. The cornea is the dome-shaped window in the front of the eye. Keratitis may be mild, moderate or severe and may be associated with inflammation of other parts of the eye. Various types of infections, dry eyes, injury and a large variety of underlying medical diseases may all lead to Keratitis. 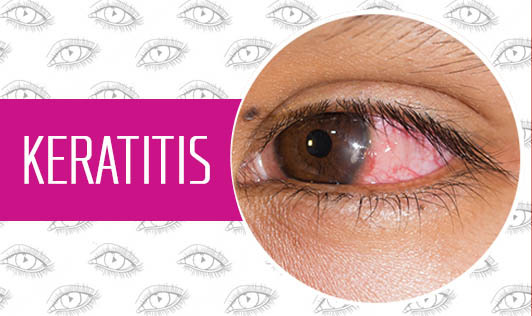 There are different types of Keratitis, classified by its location, severity and cause. • Wearing contact lenses can increase one's risk of infectious and non-infectious Keratitis, which typically stems from not disinfecting lenses properly. • Warm climate can increase one's risk of Keratitis particularly if plant material gets into the eyes which can scratch the corneal epithelium and chemicals from the plant that can cause an inflammation which may thus lead to infection. • Those with compromised immunity due to medications or diseases are at a higher risk of developing Keratitis. • Corticosteroids eye drops used to treat an eye disorder can also increase one's risk of developing Keratitis. • Protect your cornea from cuts with sports and protective eyewear. • If you have a cold sore or genital herpes, avoid touching your eyes and avoid over the counter steroid eye drops as it can worsen the infection. • If you wear contact lenses daily, wash, rinse and dry your hands thoroughly before handling them. Follow your eye care professional's recommendations for taking care of your lenses. • Avoid sharing eye make-up. • Eat a well balanced diet including vitamin A rich foods such as carrots or spinach. If you notice any signs or symptoms of Keratitis, contact your doctor immediately to avoid complications!